"I had an epiphany that it was going to be a great day as I wasn't all that surprised at how good I felt. I didn't see the runners ahead of me as enemies. I saw them as allies - the faster they ran, the faster I was likely to run. This is an important and valuable cognitive construct for all competitive athletes. Competition anxiety - which usually robs us of some of our efficacy by causing us to run less fluidly and relaxed - grows out of a focus and concern about things over which we have little or no control." - Boston Marathon Champion Jack Fultz describing the race. At that point he was in 10th and looking ahead at 9 runners spread out on the hill ahead. What Africans think of Solinsky? HEY!!!! 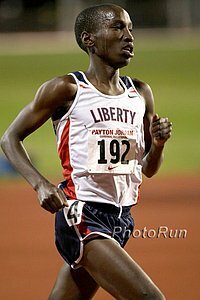 Hows come Lagat does not get a Letsrun opening Flashpage that says, "LAGAT 12:54"
Lagat Gets 5,000 American Record, Solinsky Runs 12:56! 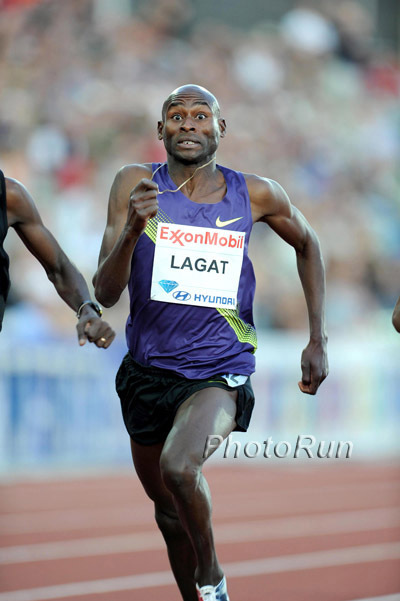 Lagat and Solinsky both ran well as the American 5,000m standard keeps getting tougher and tougher. 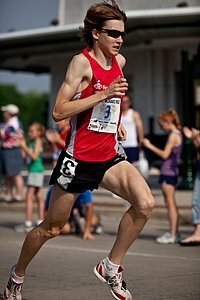 Solinsky's 57-second finishing lap couldn't keep up with the front runners as his 12:56 just missed Ritz's 12:56 from '09. The 800m world record (1:41.11) is truly in jeopardy this year as David Rudisha and Abubaker Kaki ran 1:42.04 and 1:42.23 in the race of the evening. Can Blood Or Bizarri Beat Koll At Eugene? Sam Chelanga Totally Underappreciated Will he win the 10k/5k double? Chelanga ran 27:08 a few weeks ago although hardly anyone noticed. Hard to believe Galen Rupp, David McNeill and others have shut him out of NCAA track titles. Recommended Read: Athletics Weekly Catches Up With 1968 100yd Record Setter Charlie Greene Greene just got a kidney transplant and is fighting to walk again - he urges people to give back to the sport. NY Mini Hosts 7 Former World Champions And Interesting International Field Two all-women's races this weekend the next two weekends- Teyba Erkesso and Co. in the Freihofer's Run For Women this weekend in Employee #1's birth city, Albany and Linet Masai, Teyba Erkesso, and 6 More World Champs in New York next week. *Recommended Read: Former UW Roommates Broke Pole Vault And Long Jump World Records 47 Years Ago The long jump record (ridiculous 8.33m) is still a point of contention as there was no wind gauge, while the pole vault record breaker suffered a massive trampoline injury soon after his WR. *World War II Bombardier And US 5,000m Olympian Lou Zamperini To Be Subject Of New Laura Hillenbrand Novel Nicholas Cage is slated to play Zamperini in a film based on the Seabiscuit novelist's 7-year research project. John Meyer: Boulder Group Helps End "Shamateurism"
*Trust In Boulder - How Frank Shorter And Co. Helped End Age Of "Shamateurism"
*Herb Lindsay Talks About Getting Paid Under The Table In Early '80s Things were a lot different for the top runners 30 years ago. Then again, $1,000 went a lot farther in 1980 than it does today. Dwain Chambers Runs 10.02 (Sort Of) As American Lashauntea Moore Joins The Sub-11.00 Club In Brazil Chambers really ran a 10.19 but into a stiff headwind that converts to a 10.02 according to this website. Moore is now the 3rd fastest at 100m this year in the world. British Team In Crisis Mode For European Champs Due To Injuries British 100m champ Simeon Williamson is out of action all summer long as are several other athletes. LRC Photos - Lukas Verzbicas 3:56 Road Mile The winner ran 3:53 but the debate is on - how much did the 400m of downhill improve the time? Usain Bolt Out Of adidas NYC With Achilles Stiffness Track's Sprint King apologizes to the fans but Dr. recommends 2-3 weeks off to prevent further damage. Bolder Boulder: Ethiopian Teams Sweep, Team Colorado Beats Team USA The Ethiopian men had a perfect score of 6 and the women took 2 of the top 3 places. *Results Colorado men Vaughn, Braun and Carney of Team Colorado took it to Team USA and Team Kenya. *Race Video Guy fully decked out as Moses sprints out to the lead. New UK 10k Road Record As Mo Farah Beats Olympic Bronze Medallist Micah Kogo A big road win for Mo Farah as he beat recent UK 10k track record holder Chris Thompson as well. Farah will go on the track and try to get the UK 10k track record next week. Mary Keitany won the women's race easily in just over 31 minutes. Get Under The Big Tent - Mary Wittenberg Writes Unofficial USA Running CEO Mary Wittenberg wants to see more events working together to promote the sport in a fan-friendly format. 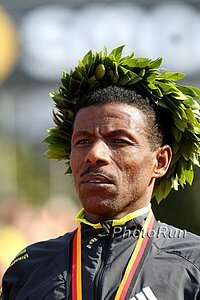 *Haile Gebrselassie Coming To NYC For Wednesday's National Running Day Somehow we hope the unverified report of Geb running Berlin this year is wrong. Him being in NY can't be a bad thing. *Nick Arciniaga 2:08:58 At Rock N Roll San Diego Sorry, that's a prediction, not a result. Will World Record #70 Fall In Men's 800 In Oslo? The David Rudisha-Abubaker Kaki battle is arguably the most anticipated matchup of the meet. Will Chris Solinsky Or Bernard Lagat Get American Record In Stacked Men's 5,000? The race is certainly loaded, as it includes Eliud Kipchoge and Vincent Chepkok, who have both run 12:51 already this year. Sanya Richards Diary: "I am doing everything I can to get back as soon as possible." Fastest Marathoner Of 2010, London Winner Liliya Shobukhova, Will Race A Track 10,000 On June 26th The race will serve as a qualifier for the European champs. Asian Grand Prix Kicks Off The first of three events saw some good 800 times (1:47/2:02).